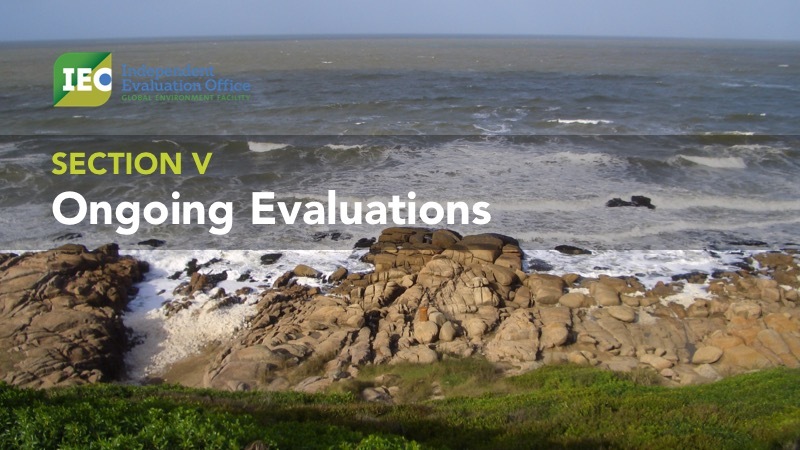 The IEO wanted to improve the presentation of its semi-annual evaluation report to the GEF Council, a crucial moment for their senior management to communicate with the entity that oversees their work and that of the GEF. In the past, their presentations had a look common to most PowerPoint presentations by large organizations. This is a few sample slides of the previous one, for the 50th Council Meeting, in June 2016. This time, they wanted an improvement in messaging and visual. We discussed what bothered them with the previous presentation, a necessary step to verify assumptions before making suggestions as an external party. Then we discussed the narrative structure and finally came up with a design. The sections would be presented in a different order from the report, to better set up the conversation with the Council. Some of the phrasing would need to be adjusted accordingly. Not all the recommendations would be written on the slides: only the most important or those that called for the attention of the Council. There would be two speakers. Rather than having dedicated sections each, we would give the floor to the one most confortable with the topic at hand, which meant sharing slides at times. We then created a storyboard with the messages and visuals for each slides, allowing us to bainstorm and make changes at little cost. Our contraints included the use of the green and blue of the IEO logo, recently redesigned. We chose green as our primary colour because it is less common and more closely related to the environmental topic of the presentation. Other than for the title slide, we were free to forfeit the corporate slide background, which would give us space and flexibility. We chose a default black background because of the presentation settings. We made the most out of the treasure trove of environmental pictures from the GEF. We conducted extensive research, sometimes consulting staff, to find pictures relevant to the content wherever possible. In many cases, the background pictures were from projects discussed in the slide. When that was the case, we provided the country name and project number at the bottom of the slide, emphasizing this relevance. Below is another section where we used full screen pictures with titles overlay. It was about ongoing evaluations. Note how only the titles are written: the speakers are communicating the details verbally. The goal is to keep the focus on the speaker and not to interfere or compete with text-heavy slides. We chose to have a consistent title slide to mark the beginning of a new section. On each of them, we indicated the section number from the report, to guide the audience who might want to follow it. We also decided to include no other text, so as to convey the simple message that the speakers were moving to a different section. Here's a sample. An important purpose of the presentation was to update the Council on the status and anticipated completion date of a number of evaluations carried by the IEO. This timeline was already in the report in the form of a table (right), with groupings by themes. This provided a good opportunity to use a visual timeline that would help the Council understand the sequence of the evaluations across themes. Given that they had the precise dates in the report in front of them with a design that focused on this sequence. We fit it on two slides because of the need to keep the text large enough for the audience to see. The fade-in bullets helped to convey the idea of a process preceding this step. With this design, it becomes clear for instance that the evaluations about institutional issues and the thematic evaluations would be delivered towards the end of the period, almost all at the same time. Below is an example where we decided to convey only the headlines of a more detailed timeline. Again, the audience had the report in their hands and the speaker would be free to focus on what would be relevant in context. We decided to use a few maps from the semi-annual report and relevant technical papers because they provided a good visual support to our main messages. The purpose of the first map was to illustrate the numerous field visits conducted by the IEO staff for the present evaluation. Notice the exclusion of all text outside of a title. The second map was part of an evaluation, to show the location of the GEF land degradation projects. The solid markers on the original map obscured the multiplication of projects in a given space. In the redesign, we used transparency to convey the concentration and overlap of projects. We also harmonized to the dark theme of the presentation. Sparklines are usually found where space is at a premium and, given the low resolution of slides, it is the case in a presentation. We used them on a single slide to convey recent trends. Pie charts are good to communicate a single number and that's how we used them on a number of slides, to present survey results or portfolio numbers. After agreeing on the key concepts to represent, we created custom icons and illustrations to represent them, rather than using plain bullet points. Subtle animations were present throughout the presentation, such as fades between the slides or the automatic appearance of elements. They blended in without distracting the audience. The opening sequence was meant to appear before the presentation, while the speakers were finishing their set up and the audience was coming back from a coffee break. We experimented with a sequence of several images and messages, but settled on a single slide given the context and time constraints. Several slides gave control to the speakers to add the points according to their pace. Here they are presented as one sequence. Other slides were entirely animated without requiring the intervention of the speakers, to allow them to focus on their talk. This specific slide was meant to provide a humorous illustration of the problem at hand. You can download the entire presentation (PDF) on the GEF IEO website.